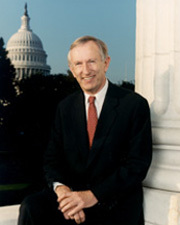 JEFFORDS, James Merrill, a Representative and a Senator from Vermont; born in Rutland, Rutland County, Vt., May 11, 1934; attended public schools; B.S., Yale University 1956; LL.B., Harvard University 1962; admitted to the Vermont bar in 1962 and commenced practice in Rutland; served in the United States Navy 1956-1959 and later in the Naval Reserve, retiring as captain; served in Vermont senate 1967-1968; Vermont Attorney General 1969-1973; delegate to Vermont State Republican conventions 1964, 1968, 1972; elected as a Republican to the Ninety-fourth and to the six succeeding Congresses (January 3, 1975-January 3, 1989); elected to the United States Senate in 1988; reelected in 1994 and 2000, and served from January 3, 1989, to January 3, 2007; switched to Independent party status effective June 6, 2001; chair, Committee on Labor and Human Resources (One Hundred Fifth Congress), Committee on Health, Education, Labor and Pensions (One Hundred Sixth Congress, One Hundred Seventh Congress [January 3, 2001; January 20, 2001-June 6, 2001]), Committee on Environment and Public Works (One Hundred Seventh Congress [June 6, 2001-January 3, 2003]); not a candidate for reelection in 2006; died on August 18, 2014; interment in Northam Cemetery, Shrewsbury, Vt..
Jeffords, James M. An Independent Man: Adventures of a Public Servant. New York: Simon & Schuster, 2003; Jeffords, James M. My Declaration of Independence. New York: Simon & Schuster, 2001.